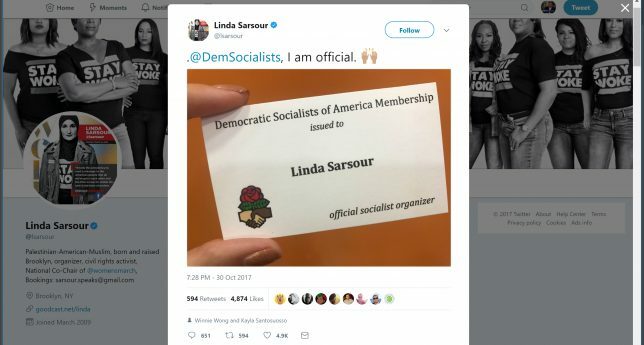 Left-wing darling Linda Sarsour, who gained notoriety for playing a significant role in organizing the Women’s March last January, recently came out as a card-carrying member of the Marxist organization, Democratic Socialists of America (DSA). Sarsour, a Palestinian-American Muslim, co-founded MPower Change and Muslims for Ferguson. The latter group protested outside of the 2016 Republican National Convention, predicting a “new wave of terror” against “people of color” that would follow if Donald Trump became president. You'll know when you're living under Sharia Law if suddenly all your loans & credit cards become interest free. Sound nice, doesn't it? That’s her purpose. It doesn’t matter if facts must be stretched and false equivalencies created; the ultimate goal is to shame the U.S. And that requires finding common ground with others who have the same goal—like socialists. But the common hatred that Marxists and Islamists share of the United States is not all that unites them. Vadum notes that Muslim societies have shown themselves friendly to socialism from the beginning. Advocates of this Islamic socialist ideology point to the example of Abu Dharr al-Ghifari…a companion of Muhammad who is said to have criticized the accumulation of wealth by the Umayyad Caliphate and urged its coercive redistribution. . . . It is also notable that Muhammad himself created a welfare state in Medina when he ruled it. . . In the 1800s Jamal al-Din al-Afghani argued that socialism was an ideology that grew out of Arabian Bedouin traditions before the advent of Islam. Socialism complemented Islam, he believed. Communists, for their part, have never shied away from working with radical Islamists. They both share a common enemy: Western Civilization. Soviet Islam, the second installment of the film series America Under Siege by Dangerous Documentaries, shows how the Soviet Union and radical Islam regularly collaborated during the Cold War. In addition to aiding the Muslim Brotherhood which was founded to restore a Muslim Caliphate, the KGB infiltrated and worked with the U.S.-based group Nation of Islam. Most recently, the communist Antifa movement has also collaborated with political Islam. This summer the FBI issued a report, showing that Antifa members have regularly communicated with radical Islamists, and even downloaded bomb-making instructions from ISIS websites. A group from Oakland, Calif., met with al-Qaeda operatives in Germany and an American anarchist travelled to Syria to receive training at the hands of ISIS. Sarsour’s unmasking as a DSA member should surprise no one. Marxists and people like Sarsour share many important traits, such as hatred of the U.S., hatred of Christianity, hatred of Western Civilization, and last, but not least, a deep hatred of Israel. One could say socialists and Islamists are a match made in Jannah. Sarsour and her ilk are trying to do just that.